This is a copy of a news article I appeared in on October 30, 2017.. 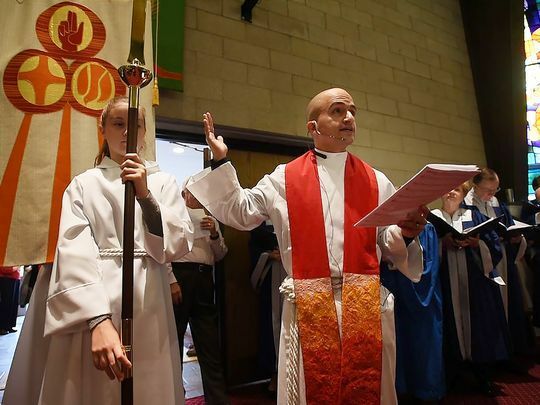 It celebrates a joint worship service with First Congregational in Park Ridge, Christ Lutheran Church, and Pascack Reformed Church to honor the 500th Anniversary of the Reformation. My picture appeared on the cover of the local section in the Record. Article by Michael W. Curley, Jr. Photo by Mitsu Yasukawa. Includes video! Luther’s break from the Catholic Church started the Protestant movement as others followed suit, resulting in numerous denominations splitting from what was at the time the only Christian church. The various denominations of Christianity are still related after the Reformation, often referred to as a schism within the church, Stutzel said. Even though they each approach their faith differently, he said, the denominations are more similar than they are different. As different faiths have often used arguments on faith to remain separate, Sunday represented “something strange,” Stutzel said, likening the shared service to Luther’s habit of inviting many different people to his home for dinner to talk with them. The pastors said they have been working toward bringing their congregations together since they each came to their churches in the last three years, including a joint Cross Walk around Easter. They decided to make events out of the fifth Sunday of a month into special events, and with Reformation Sunday and the 500th anniversary of the Reformation falling on a fifth Sunday, it made an obvious choice to kick off the practice.